When we got into town in the late afternoon on a Friday, we immediately made our way to one of my all-time faves (in any American city), Pizzeria Bianco. 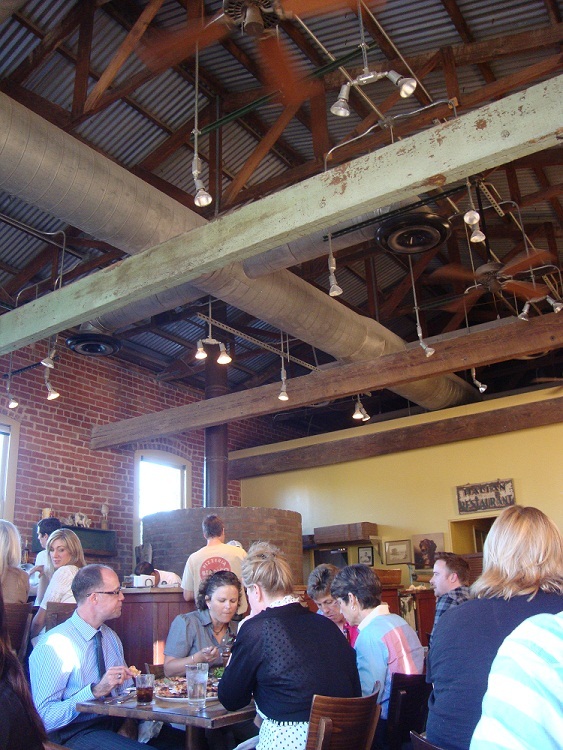 I’ve dined here over a dozen times in my time living in Phoenix and every time was quite memorable. I couldn’t believe that Ryan had never been here before, so at around 3:30 we made our way through beautiful Heritage Square (one of my old reading under a tree haunts) to the famous pizzeria. I used to run into Chris Bianco frequently as I used to mobile-office it up at Lux Coffee and lunch next door at Pane Bianco, and the guy’s brilliant (and incredibly sweet and friendly). We lucked out with their lunch hours and snagged one of the last tables with a…ZERO MINUTE WAIT. If anyone knows anything about Pizzeria Bianco is that the line to get a table can get quite long. It’s been nearly two years since I have been to PB, but I’m glad that nothing’s changed. The service is incredibly attentive, the atmosphere is rustic/casual-chic, and the food is both delicious and reasonably priced. Bianco has high standards for quality and so every aspect of our lunch was flawless. From the table bread which was soft on the inside but with a good crust on the outside, the high-quality olive oil that came with it, and the locally sourced produce they use, an experience at Pizzeria Bianco is unsurpassed. We started off with one of my most favorite things: the Spiedini appetizer. Traditionally, spiedini are the Italian equivalent of kebabs or yakitori; skewered meats grilled or baked in open fire. 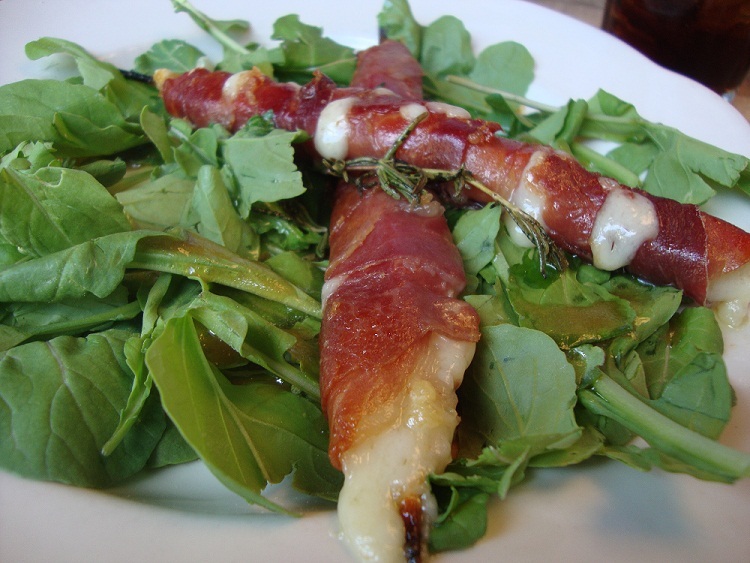 Bianco’s version is sinful–prosciutto wrapped fontina cheese on a wooden stick, grilled in the oven. Lusciously gooey cheese encapsulated in salty, fatty pork and served on a bed of peppery local arugula. Since we were having lunch so late and we had big dinner plans, we decided to split one pizza (which was more than enough). 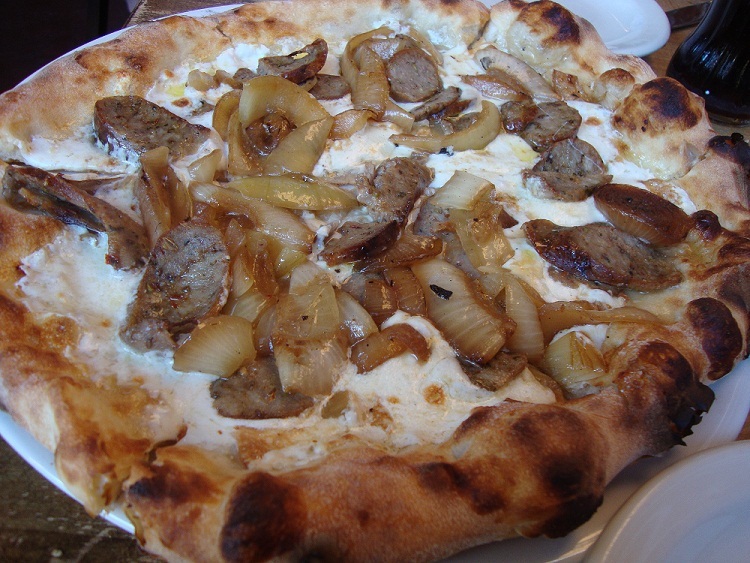 We went with the Wiseguy which featured wood-roasted onions (sweet and tender), house-smoked mozzarella, and fennel sausage. The smoke on the mozzarella was perfect; not too overwhelming, but very distinct, and the sausage was dense and locally made by Schreiner’s Phoenix. Although the toppings on this pizza were delicious, the highlight was really in the dough. I’ve always thought that what really sets Bianco’s pizzas apart from everyone else was the quality and texture of the crust. Crisp, yet delicate; soft enough but with a slight chew. Pizzeria Bianco has mastered pizza dough. Just thinking about this meal is making me wish I could just hop on a 1hr flight back to Phoenix to make it in time for dinner. 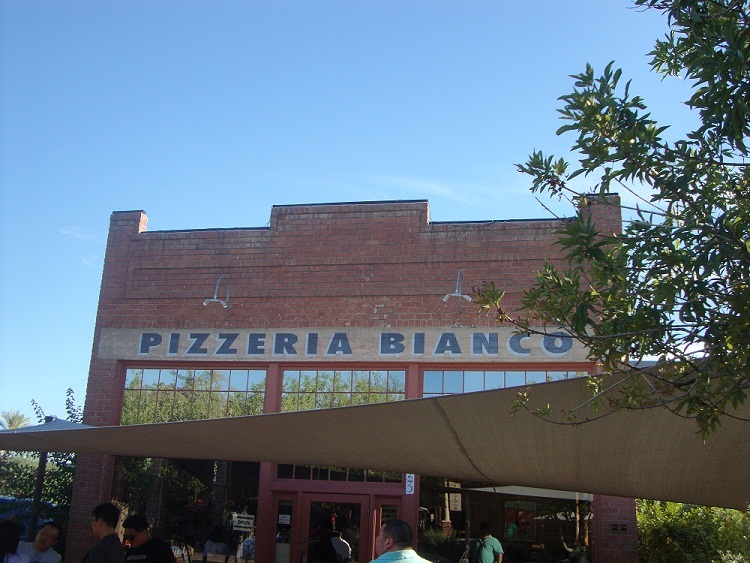 Pizzeria Bianco is located at 623 E. Adams St. within Heritage Square. TIPS: Try and make reservations for groups of 6 or more or try to make it for lunch. If coming for dinner, come prepared for a bit of a wait. Bar Bianco next door is a great way to kill some time.